Noto is a font family comprising over a hundred individual fonts, which are together designed to cover all the scripts encoded in the Unicode standard. As of October 2016[update] Noto fonts cover all 93 scripts defined in Unicode version 6.0 (released 2010), although less than 30,000 of the nearly 75,000 CJK unified ideographs in version 6.0 are covered. In total Noto fonts cover nearly 64,000 characters, which is under half of the 137,439 characters defined in Unicode 11.0 (released in June 2018). The Noto family is designed with the goal of achieving visual harmony (e.g., compatible heights and stroke thicknesses) across multiple languages/scripts. Commissioned by Google, the font is licensed under the SIL Open Font License. Until September 2015, the fonts were under the Apache License 2.0. When text is rendered by a computer, sometimes there will be characters in the text that cannot be displayed, because no font that supports them is available to the computer. When this occurs, small boxes are shown to represent the characters. In slang those small boxes have sometimes been called "tofu". Noto, as in no tofu, aims to remove tofu from the Web. See also mojibake, which results from encoding issues. Color emoji from Noto Emoji Project. Noto Emoji Project provides color and black-and-white emoji fonts. The color version is used by Google's Gmail web interface, Google Hangouts, Chrome OS and Android. Noto Sans and Noto Serif, which contain Latin, Greek and Cyrillic glyphs, are derived from Droid fonts. Noto CJK fonts are rebranded versions of Adobe Source fonts, developed by Adobe and Google which contains Chinese characters, Hangul and Kana; Latin-script letters and numerals are taken from the Source Pro fonts. 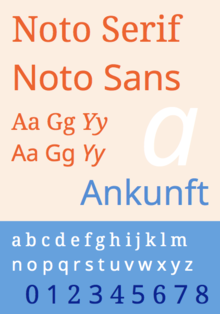 As of 8 October 2016[update] there are 114 Noto fonts, of which 95 are sans-serif style, 13 are serif style, and six fonts are not classified as serif or sans-serif. The Noto Color Emoji font only works under Android and Linux, and cannot be installed under macOS or Microsoft Windows. These fonts cover 93 out of the 145 scripts defined in Unicode version 11.0 (released in June 2018), as well as various syllables and emoji which do not belong to a specific script. All scripts encoded up to Unicode version 6.0 (released October 2010) are covered by Noto fonts, although not all characters defined in Unicode version 6.0 are covered. In particular, only about 30,000 of the 74,616 CJK unified ideographs defined in Unicode version 6.0 are covered by Noto fonts. None of the 53 scripts and 1 blocks encoded between Unicode version 6.1 and 11.0 are covered by Noto fonts, although some symbols, emoji, and characters added to existing scripts after version 6.0 are covered. It is a design goal for 'Phase 3' to cover all characters in Unicode version 9.0 except for most of CJK unified ideographs outside the Basic Multilingual Plane. The Noto Symbols font includes a large variety of symbols, including alchemical signs, dingbats, numbers and letters enclosed in circles for lists, playing cards, domino and Mahjong tiles, chess piece icons, Greek, Byzantine and regular musical symbols and arrow symbols. Among mathematical symbols, it includes blackboard bold glyphs, mathematical sans-serif font modelled on Helvetica, Fraktur and script fonts, hexagram and Aegean numerals. ^ "Noto Font". Retrieved November 24, 2015. ^ "Add NEWS for license change - googlei18n/noto-fonts". Retrieved 2016-04-03. ^ Mizra, Tanvi. "Can Google Build A Typeface To Support Every Written Language?". NPR. Retrieved 5 August 2014. ^ "Noto Sans font specimen". Google Fonts. Retrieved 23 February 2017. ^ Nathan Willis (1 October 2014). "Google and Adobe's pan-CJK open font". LWN.net. Retrieved 23 February 2017. ^ "Noto Color Emoji". Retrieved 8 October 2016. ^ "Frequently Asked Questions: What are Google's plans for Noto (so called "Phase 3")?". Retrieved 8 October 2010.